November 17, Weds – 6:30 pm – 9:30 pm the Community Education Council for District 3 (CEC3) will be having a meeting to discuss the co-location of Upper West Side Success Academy, a charter school, in the Robert E. Simon School Complex. 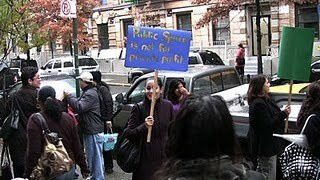 As you might have heard, UWS Success already tried to claim space in another District 3 school, P.S. 145. These efforts were unsuccessful because of organized action by the community. The building now targeted already houses a primary school, P.S. 165, and two middle schools, I.S. 165 Global Scholars, and Mott Hall II. Various members of the community disagree with this proposal because of the negative impact this would have on the existing schools in the building; there is simply not enough space. Another issue being discussed at this meeting is rezoning, they are proposing to cut the zone for P.S. 165, which would undoubtedly decrease enrollment, and make it easier to establish a charter in the building. P.S./I.S. 165 is not a failing school. It is renown for its Dual Language and Special Education programs. Community schools deserve to be promoted and deserve to flourish. The establishment of UWS in the building is not supportive to the community schools in the building. Teachers, parents and community members have already begun to organize in response. Please see some of our efforts at: http://thecheetah165.blogspot.com/2010/11/robert-e.html . Also, in addition to resisting the charter school co-locations, it’s also about resisting co-location plans the doe comes up with for public schools as well…how are decisions made about who gets moved, who gets relocated and co-located, etc. And about a district that is extremely segregated and unequal and becoming more so…. no decisions about co-location or rezoning without full community participation! nothing about us without us is for us! Also, we have wonderful community schools like 145 and 165 that deserve to be respected and allowed to flourish. Please attend the CEC 3 meeting in solidarity. Campaign to stop the Moskowitz Charter Co-location.